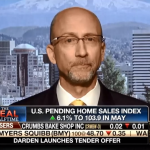 Yesterday (Monday), Money Morning Chief Investment Strategist Keith Fitz-Gerald appeared on FOX Business' "Varney & Co."to talk about the record-breaking U.S. Pending Home Sales Index numbers that were released the same day. According to the National Association of Realtors (NAR), its U.S. Pending Home Sales (PHS) Index increased 6.1% in May to 103.9.